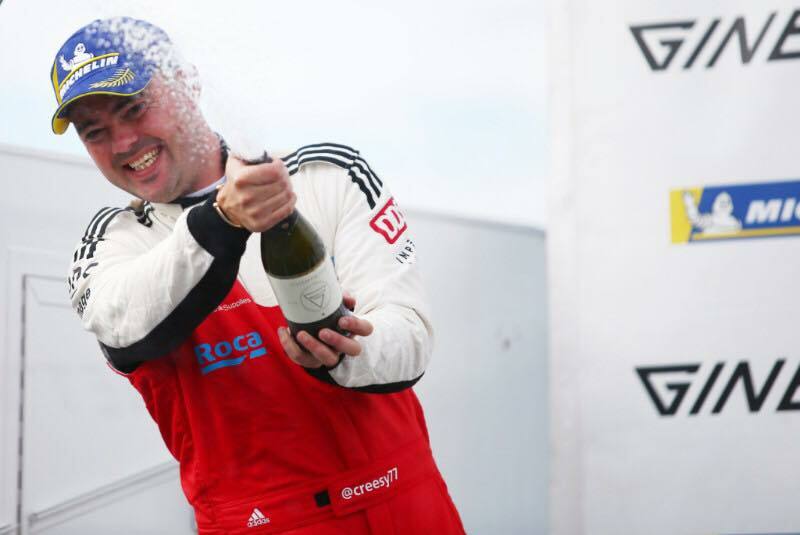 What a weekend for Century Motorsport! 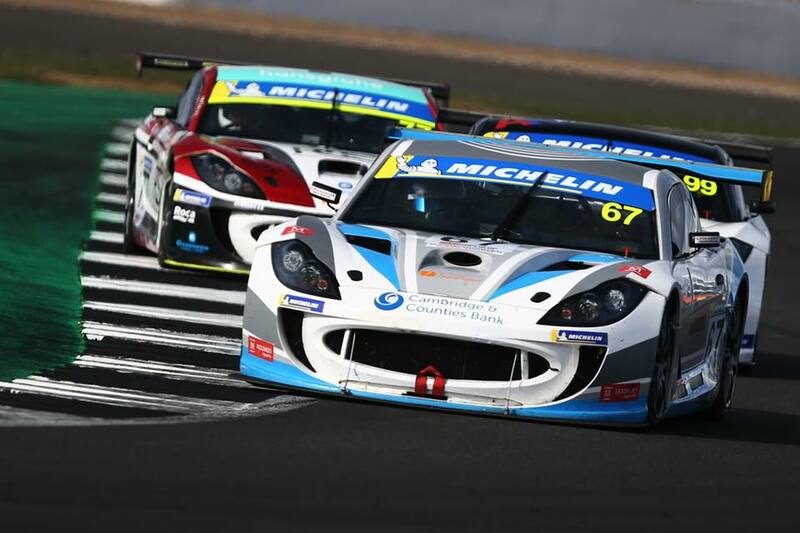 The penultimate round of the Ginetta GT4 SuperCup was held at Silverstone Circuit on 15th – 16th September. Two of their drivers managed to set new personal records, bringing home plenty of championship points and extending the lead in the Amateur Class Championship. The qualifying session got underway on Saturday morning and the times of all 18 drivers (Pro and Am) were incredibly close. There was only 1.681s between the slowest and quickest times! Angus Fender posted the fifth quickest time, with Andrew Gordon-Colebrooke not far behind in sixth (both Pro Class). Michael Crees posted the second quickest time in the Amateur Class, missing pole position by just five thousandths of a second. Later that afternoon, it was time for the first race. Fender dropped a couple of places off the line and then spent the majority of the race battling with the #12 car. On a couple of occasions throughout the race, Fender managed to pass him however a couple of laps from the end, the #12 car found a way past Fender, leaving him to settle with seventh place at the finish line. Gordon-Colebrooke had a great start and had moved up to fourth position during the first lap. He later dropped down from fourth to fifth and he found himself in no-mans-land and had a very quiet race, maintaining his position throughout, leaving him to finish in fifth place. Crees started the race from second on the Am Class grid. Within just three laps, he managed to grab the lead from the #66 car. Crees then controlled the rest of the race until the chequered flag, not letting the constant pressure from behind deter him. Crees also claimed the fastest Am Class lap of the race with a time of 59.021s, less than half a second off the fastest Pro Class lap time. Race 2 got underway Sunday morning. Again, Gordon-Colebrooke had a terrific start off the line and got right up to third position however unfortunately a minor mistake, causing him to spin out, saw him drop right to the back of the grid in 17th position. He then spent the rest of the race filtering through the traffic to make the best recovery he could. He did an excellent job of this, gaining at least one position on every lap for six laps running. He then stabilised in ninth position, unable to make a move past the two Am class front-runners who were battling ahead of him (the leader being Crees). 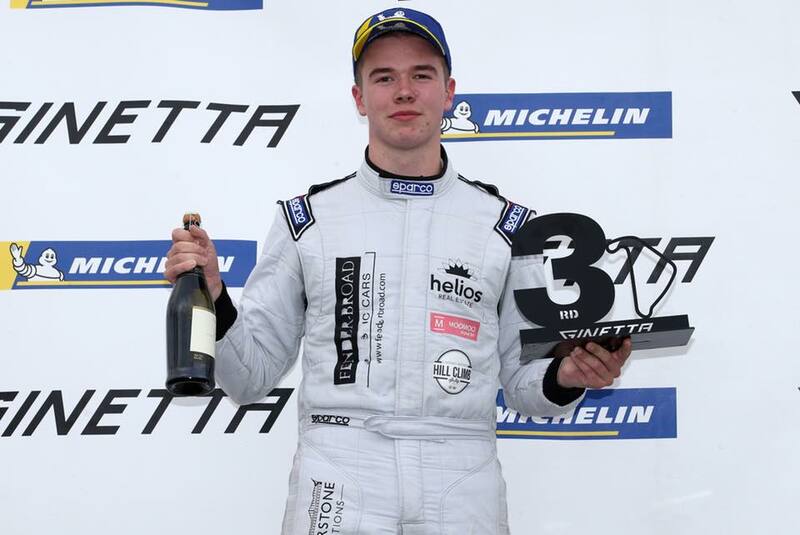 He settled with seventh (Pro Class) position and ninth overall, at the chequered flag. Fender also had a very good start and by lap 14, he had found third place. He managed to hold this position for the rest of the race right up until the final lap, where some contact was made at Luffield with the #41 car, causing Fender to lose his third position. Fortunately for Fender, a post-race judicial deemed it to have been an unfair advantage and they swapped the third and fourth places, leaving Fender with the podium result he deserved! Crees started the race from pole position (Am Class) and he superbly controlled the entire race, going on to claim Am Class race victory for the second time in a row. The third race got underway later that afternoon and was shown live on ITV4. This race saw a reverse grid of the top four positions, meaning Fender would start from second, Gordon-Colebrooke would start from seventh and Crees would start from fourth in the Am Class. Fender dropped two positions in the first few laps of the race. He then made a move to get that third position back just after the halfway point in the race. He then defended his position well and crossed the finish line in third place yet again, achieving his first ever double-podium in SuperCup! Gordon-Colebrooke made a good start but then he dropped one position by lap 5. He spent the rest of the race trying to find a way through the traffic, eventually finding sixth position, which is where he finished the race. Crees had a bit of work to do starting from fourth on the grid. He grabbed one place off the line, getting ahead of the #66 car. His job was made even easier by lap 3 as unfortunately the #78 car of Colin White who has produced some great battles with Crees this season, came off track and was out of the race, so this left Crees with only one car ahead of him – the #24 car of Lucky Khera. He was not so lucky as by lap 7, Crees had grabbed the lead off him. From that point onwards, Crees controlled the race, followed closely by the #66 car of Jack Minshaw. 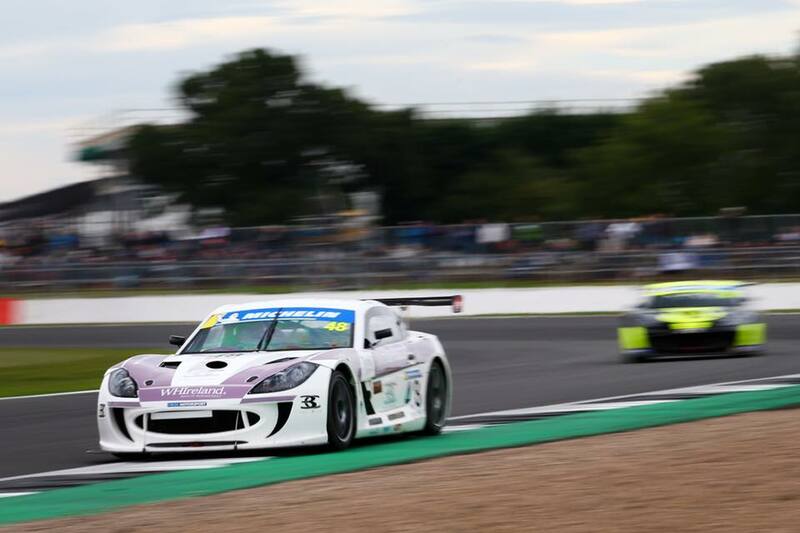 Crees went on to claim victory for the third time in a row, achieving his first ever hat trick of wins in a race weekend, along with another fastest lap (Am Class), which yet again was less than half a second off the fastest Pro Class lap. 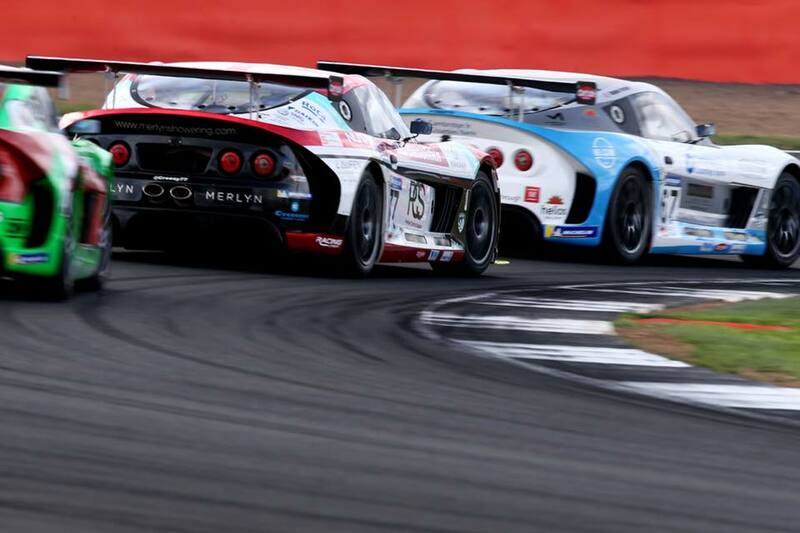 The final round of the Ginetta GT4 SuperCup is just over 1 week away at Brands Hatch! “This weekend was a solid one for me, the pace in testing on Thursday and Friday was good and left me feeling confident of some good results. Qualifying was as close as I expected it to be and it turned out that half a tenth was the difference between myself in 6th and 3rd place! But I couldn’t really complain too much about my lap. I was happy to convert that into a strong race performance to give me a 5th place in race 1 and a fantastic start in race 2 saw me up to 3rd by the 1st corner! Unfortunately a small mistake from myself would cost me but I fought back through the field well. As for race 3, it was a tricky one being a bit further back in the pack but I kept my nose clean to bring home another top 6 finish. I need to give my thanks to Century Motorsport who, yet again, were on top form all weekend. “Triple win! One hand on the title! Thanks so much to all my family, friends, sponsors and the team for the support! Couldn’t have done this without all of you! To get 3 wins and 105 points out of 107 was amazing!! Feel sorry for Colin White crashing out as we have had a great battle all season! “We feel very satisfied after this weekend. I think all our drivers really came of age. Michael doing the triple was awesome – a real testament to his rapid development in race craft and speed. Angus recovered well from a difficult race one to come away with 2 podium finishes. He really got his elbows out this weekend and was the best I’ve seen him race all year. Andrew had great pace all weekend and one small error surely cost him his first podium. He is knocking on the door of a podium and I hope that this happens at brands hatch in 2 weeks time.